If you have work on any PHP based dynamic web application and in which you are using Google Chart Library for creating report and visualization of your web application data then if you want to add one more feature like make PNG Image file or PDF file from your Dynamic Google chart which you have make by fetch data from Mysql database using PHP PDO script. So here you can find step by step guide how can we easily export Google chart in PDF file format or PNG Image. We have publish many post in this site regarding how to make dynamic chart by using Google Chart with PHP script with Mysql database. For creating or exporting Google chart to PDF file first we want to convert into PNG image. So, first we need to save Google Chart as PNG Image then after we can easily export or convert into PDF file using PHP. 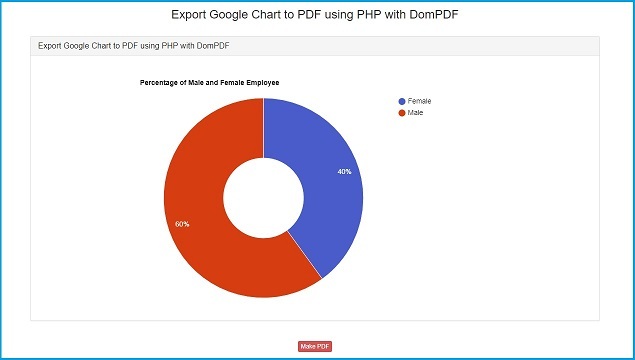 Here we have use DomPDF library for export Google chart to PDF using PHP. In below you can find source code of Creating of Dynamic Pie Chart from fetch data from Mysql database and based on data we have make Pie chart using Google Chart Library with PHP. Here we have use getImageURI() method which print Google chart as PNG Image on web page. After create PNG image from Google Chart, now we can easily export it to PDF file. There are different ways for convert PNG to PDF using PHP. For example make PDF file from HTML we have use different PHP Library like TCPDF or DOMPDF. But here we have use DOMPDF library in which we can also use Bootstrap CSS library also which steps you can find below. 1. First Download the latest version of DOMPDF Library from here. 2. Unzip DOMPDF library file and put into your working folder from where you have execute php script. 3. Make a HTML form which send action to PHP file which convert HTML code to PDF. Here we have send request to create_pdf.php. Below you can find PHP Source code of pdf.php and create_pdf.php file for convert HTML to PDF. So, this is complete and step by step source code of Exporting of Google Chart to PDF using PHP PDO script with DOMPDF Library.